I’m happy to announce that I’ll be teaching two digital media workshops the final two weeks of May this year. The first workshop will be a podcasting workshop. 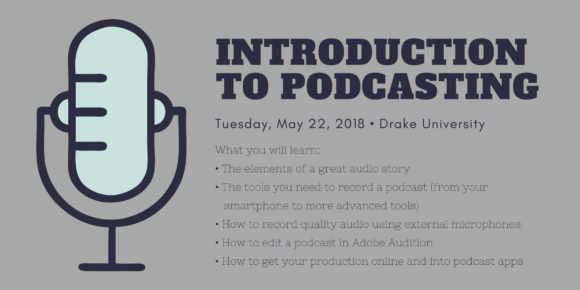 This will be my first time offering this workshop after eight years of teaching audio recording and editing to my Drake University students. The second one will build off of this blog post I wrote earlier this year and will focus on building a social media strategy that doesn’t rely so much on Facebook. Below are details and info about signing up for each workshop. This one-day class will teach you the tools and techniques needed to record, edit and launch your own podcast. Drake University professor Chris Snider will walk you through all the steps involved in creating your own podcast. Bring your podcast idea (if you have one), and we’ll get it recorded, edited and launched in class! 2018 is a pivotal year for social media as Facebook deals with privacy concerns and possible government regulation. 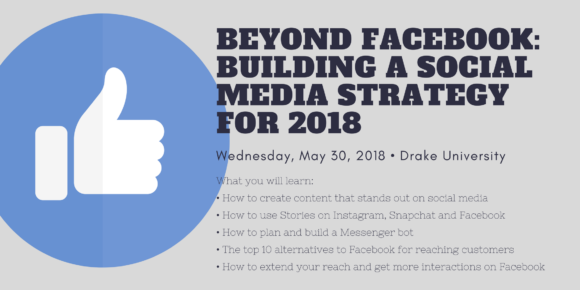 This one-day workshop will help small business owners and social media strategists understand how to build a social media strategy outside of Facebook. We will explore best practices for using Instagram, Messenger, Bots, LinkedIn, YouTube, podcasting e-mail and more. And because Facebook isn’t going anywhere, we’ll discuss best practices for using Facebook in 2018 and beyond. This class will be hands-on. We will be building content and creating plans you can take back and use with your company and clients.